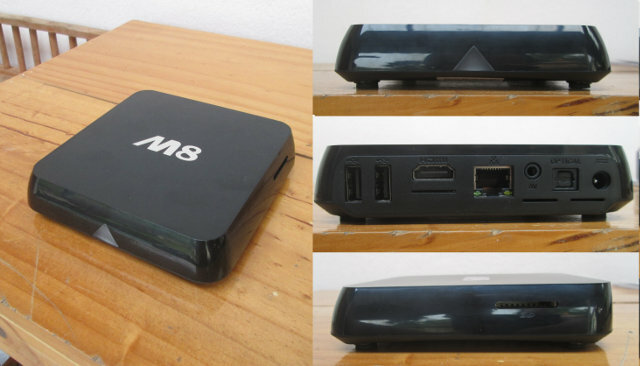 M8 TV Box is an Android media player based on Amlogic S802 that’s relatively popular. We’ve already seen XBMC Linux ported to M8 device, for people who want a more pure XBMC experience, and automatic frame rate switching, but now OpenELEC Beta 2 is also available for the device thanks to Alex Deryskyba (Codesnake). The firmware image (OpenELEC-Meson8-K200-devel-test build 2.zip) will work on M8 / TM8, and any other Amlogic S802 devices based on K200 board. It is based on OpenELEC 4.1.2 and Linux 3.10, and a beta version, so there may still be some bugs, for example Bluetooth is not working. One very interesting feature is built-in VDR / Tvheadend DVB backends which means you should be able to use one of these USB tuners to watch Live TV from your box via satellite (DVB-S/S2), cable (DVB-C) or digital terrestrial TV (DVB-T2/ATSC) dongle. The zip files contains three files (OpenELEC-CodeSnake-Meson8-K200-update.zip, factory_update_param.aml, recovery.img), and installation should be easy, as you just need to copy these three files to an SD card, enter recovery mode, and wait for the update to complete. This will complete overwrite your Android firmware, so if you just want to try it out, make sure you backup your app/data before doing an update. Thanks to Ovidiu for the tip! Tvheadend DVB backends which means you should be able to use one of these USB tuner to watch and stream Live TV from your box via a terrestrial Digital Video Broadcast (DVB-T/T2),satellite (DVB-S/S2), and cable (DVB-C) dongle. Looks like the (super cheap) RTL2832 tuners aren’t supported? Does it support the Genpix Tuner? However, if your device is not listed, it does not mean it is not supported. Many dongles supported in Linux should work in OpenELEC according to that page. The images don’t work on the Beelink M8B round box. The AMLinux image does. Wonder if we can get an image that lets us install an Archlinux rfs and use it in place. Sorry, I forgot to clearly mention this is for Eny Technology / Shenzhen Tomato M8. Beelink M8 is different. K200 reference board , Oleks working now to extend support on s805 and s812 Amlogic SoC. The code is public and anybody with some skill can manipulate it to make it support other tuners too. For example Vpeter built images with usb TBS tuners support and so on. OpenELEC support for Amlogic S805 and S812 would be awesome! Any news on official support for Amlogic from the OpenELEC team? Maybe you could interview these guys as well as OpenELEC team? officiall amlogic not in support. @cnxsoft so are there any working builds for Beelink S802 round boxes please? None that I am aware of. But it’s probably just a matter of changing the DTS file, and using the right bootloader. Just checked Sundtek USB tuner and it works. I can’t download the firmware image from the link. Maybe the link was broken. Can anybody help me where I can download the file, or please let me know another link for the firmware. Why is ethernet so slow compared to wireless?? hello.. having got one of these M8 boxes the square one.. i ound this page..
ive used openelec on my pi so have heard of it before. i have a kworld dual usb tuner and thought .. id be able to plug it into my M8 against all logic since im sure those pvr addons require external feeds? also after flashing Openelec onto my m8 i put the kworld tuner into a usb slot on M8 and it just locks up. when it was fully android it did not lockup. i was looking forward to my M8 beeing the onestop of all things digital but i think this claim of this tuner working on a single android device is a little misleading. I can’t see Kworld in the list of supported USB tuners, so it might be why it does not work. Will these images work on a 1gb M8 also?? can I boot openelec off of an SD card to use on my m8 box?